HIL simulation and testing is gaining new attention for embedded electronics in safety-critical markets. Embedded electronics are showing up nearly everywhere these days, in cars, smart appliances, medical devices—even fighter jets. Making sure those real-time embedded systems will work correctly is the aim of hardware-in-the-loop simulation and testing, which puts the systems through their paces in a virtual environment. In effect, HIL simulation adds a mathematical representation of all functional areas within a system. That system can be quite large, even to the point where it encompasses an entire plant or factory, but more recently the biggest application area involves the growing amount of electronic content within cars. As autonomous vehicle technology advances, the components of self-driving will need to pass HIL simulation and testing to qualify as automotive-grade electronics. And while automotive is a leading application in HIL, the technology also can be applied to offshore and marine systems, power systems (such as large-scale electrical grids, power management units, static synchronous compensator devices, and supervisory control and data acquisition systems), radar systems, and robotics, especially the complex controllers used in robots. HIL testing approaches fall into two general categories, open- and closed-loop. 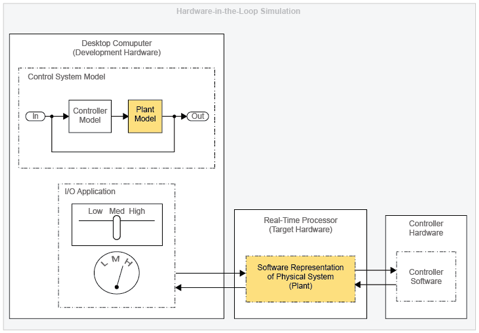 Open-loop methodologies provide a replay of model-generated or recorded-scenario data to the device under test without feedback signals from the DUT into the scenario behavior. That could include the functional test of driver-assistance systems, for example, or validation of time/position behavior of onboard units. Closed-loop methodologies, in contrast, offer model-based simulation of the traffic and physical environment with feedback signals from the device under test to the simulation environment, such as validation of complex application behavior or functional testing in complex environments, including autonomous driving, multiple vehicle interaction, and platooning algorithms. Doug Farrell, principal solutions marketing manager at National Instruments, notes the proliferation of electronic control units in automotive vehicles, now and in the future. “Software complexity is increasing and making its way into places that have previously not had software,” he says. To be sure, HIL is only one of a slew of tests that need to be applied to devices where safety is an issue. HIL is just one piece of the testing that is required. There also is built-in self-test, system-level test, in-circuit monitoring, automated test for chips, testing of software, as well as an increasing amount of pre- and post-production simulation to ensure that systems such as the AI logic in autonomous vehicles continue to work as expected. Still, HIL has a growing role here, which may seem surprising considering that hardware in the loop testing and simulation are not new concepts. They have been actively deployed for at least a couple of decades. What’s changing is the complexity of the systems being simulated and tested is growing, there is an increasing focus on divide-and-conquer approaches, and the devices being used to test them are shrinking in size. FPGAs are being included in electronics testing, rather than a regular, full-blown processor, as well. This helps in checking for package spoofing and software fault insertion. It also helps with preventing these systems from becoming obsolete as systems change. Keeping systems current is one of the reasons why there is a trend toward commercial off-the-shelf architectures in automotive electronics. “What’s happening now is that you’re running through an entire cycle of validation and going back to the beginning and making a change, then running through an entire cycle of validation and going back to the beginning and making a change—or you’re having validation and design happening concurrently,” Farrell says. This is partly due to more government regulation in aerospace electronics. Building “iron birds” to model aircraft under development is the traditional way to test systems and subsystems. White goods – smart refrigerators, washing machines, and other household appliances – also benefit from HIL simulation and testing. NI isn’t alone in this market. The Mathworks offers HIL simulation technology. Other HIL vendors include Eontronix, IPG Automotive GmbH, LHP Engineering Solutions, MicroNova AG, Modeling Tech, Opal-RT Technologies, Speedgoat GmbH, Typhoon HIL, and Wineman Technology. Vector Informatik Gmbh has a foothold in this market, as well, with modular testing across complex systems. Vector targets the automotive aerospace, education and research, commercial vehicles, as well as support for the medical and military/aerospace markets. The company’s HIL test grew out of its CANoe software tool for developing, testing, and analyzing entire ECU networks and stand-alone ECUs, says John Simion, product line director for network development tools at Vector in North America. Vector primarily competes with dSPACE and ETAS in HIL, according to Simion. ETAS GmbH is a wholly owned subsidiary of the Bosch Group. Hardware-in-the-loop simulation and testing can help improve quality control for safety-critical applications in automotive, medical, and military/aerospace electronics. There are a limited number of HIL vendors, and some are going through product and technology transitions. But it appears likely that those best able to meet customer requirements will find an increasing opportunity in the future as the complexity of these systems continues to grow.